In honor of International Fraud Awareness Week, Linda Webb, fraud expert and President of Contego Services Group, LLC held an informational session with TriGen Insurance Solutions, Inc. on November 13, 2012 for children at Kids In Distress. Kids In Distress of Broward and Palm Beach Counties is a licensed nationally accredited agency working for prevention of child abuse, preservation of the family, and care and treatment of abused and neglected children. 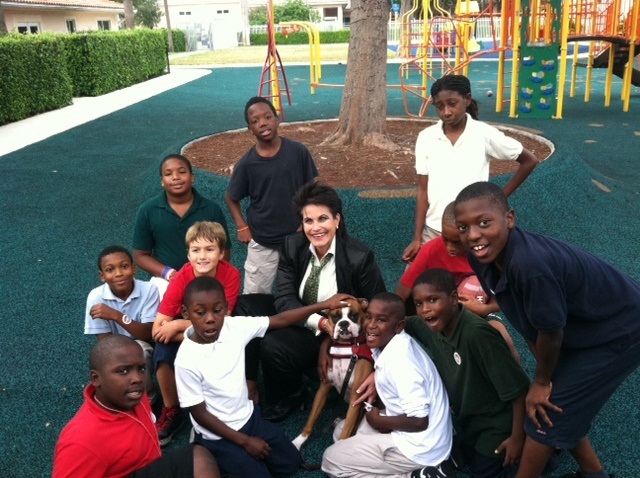 Webb, also known as the Fraud Dog, was honored to speak to children with her dog, Buster the fraud fighting dog, a Boxer breed, in tow. Children of all ages were thrilled to interact with Buster while Webb rallied the crowd in the fight against fraud. Webb’s main focus for the event was to reiterate to children that if they see something or hear something that they know is not right, to tell an adult right away. Webb closed the event by swearing-in all the children as fraud fighters with a fraud dog badge and allowing all the children the opportunity to take their picture with Buster. Linda Webb is proud to have donated to the much deserving charity, Art 4 the Animals based in Coral Springs, FL. AFTA will be having its annual event on November 18, 2012 from Noon until 5PM. For more information visit www.art4theanimals.com. Buster, Linda Webb’s fraud fighting sidekick, is always ready to help others in need, especially when it comes to her furry friends! Fairy Dogparents is a nonprofit organization that assists in preventing dogs from being surrendered to shelters due financial circumstances. Buster donated all the money in her piggy bank to help Fairy Dogparents’ keep families together. You can help too!! Visit http://www.fairydogparents.org for more information and to find out how you can help. 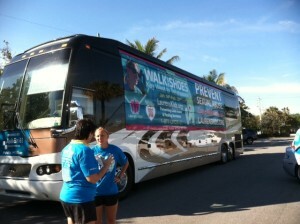 Linda Webb is proud to again sponsor the 2nd Annual Tunnel to Towers 5k in Fort Lauderdale! Join runners and volunteers for this amazing cause. Let’s come together to give back and honor all those affected by September 11th. Register TODAY! Six Points Media Group, LLC and Contego Services Group, LLC are please to announce a new initiative aimed at helping South Florida college students with an interest in the multimedia arts. This past spring Contego Services Group and Six Points Media Group, entities affiliated with Patriot National Insurance Group, ran a contest offering students at Florida Atlantic University a chance to win prize money and an internship position at Six Points Media Group. Students within the multimedia department at FAU were encouraged to showcase their talent. 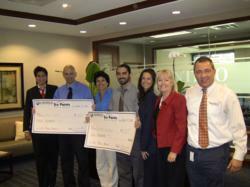 The winners were unveiled on June 11th at a ceremony at Patriot National’s corporate headquarters in Fort Lauderdale. Aleck Ford and Richard Christian were recognized for their submissions; both students showcased their talents in 3D design work. Linda Webb, President of Contego Services Group and Randy Friedman, President of Six Points Media Group were on hand to present the prizes. Mr. Ford was presented with a second-place prize of $400. Mr. Christian won $600 and an internship at Six Points Media Group. Linda Webb aka The Fraud Dog, leading fraud expert, attended a fundraiser event for the Multiple Sclerosis Foundation based in Fort Lauderdale, on March 14, 2012. Webb sponsored the event and gave a brief speech about her uncle’s battle with the disease and her support for the foundation. 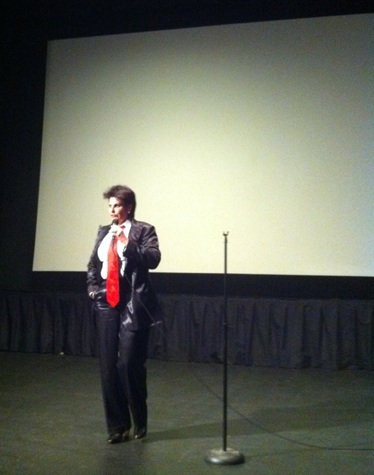 The fundraiser was a free screening of ‘Forks of Knives’ at Cinema Paradiso. Thank you to Ms. Webb for supporting the Multiple Sclerosis Foundation and her continuing philanthropy. Contego Services Group and Six Points Media Group are pleased to announce its strategic partnership with a local South Florida university, Florida Atlantic University (FAU). Contego and Six Points have created a unique opportunity for multimedia students at FAU to participate in a scholarship opportunity for two fortunate students to be awarded one thousand dollars, each. 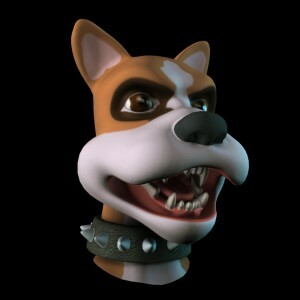 The scholarship will be awarded based on a contest between students to build Buster, the fraud fighting dog, into a cartoon character for children. Buster is Linda Webb’s, The Fraud Dog and President of Contego Services Group, partner in fighting fraud around the world. Buster is a boxer who school children can relate to and learn from. Contego and Six Points have integrated a matchless opportunity into its scholarship program wherein the winners of each scholarship will have the opportunity to become paid interns with both Contego and Six Points, working in a state of the art studio and editing suite located within Six Points Media Group. On March 13, 2012, Linda Webb, leading fraud expert, introduced Buster to the FAU Computer Graphics Club (photo above). 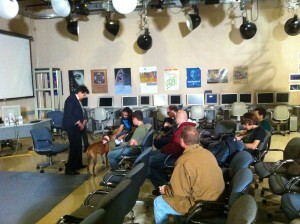 Webb and Buster were met with rave reviews and eager students. Congratulations to Contego Services Group and Six Points Media Group for being involved in the local community and providing such a unique and fruitful opportunity to FAU students.